A Warehouse Workers for Justice Rally. Governor Bruce Rauner has signed legislation giving temporary workers additional protections in the workplace. Worker rights advocates now plan to tackle issues of wage parity and work retaliation. Workers in the temporary labor industry have gained new protections after years rallying around worker's rights. These changes will impact the state's current regulations, which have remained the same for several years. Governor Bruce Rauner has signed legislation meant to increase workplace protections for temporary workers. Temp agencies must now give their workers information about equipment, protective clothing and training before sending them to a work place. And if the agency offers transportation to and from work, the service should be free of charge. These changes are meant to give temporary workers similar benefits given to permanent employees. And while the final measure overlooked issues such as protection from workplace retaliation and wage parity, supporters say the approved changes are long-overdue. Tim Bell is the executive director for the Chicago Worker's Collaborative representing temp workers. He says Illinois is now a leading example in the temporary labor industry. "It's one of the few states in the country that really recognizes the changes in the economy and in the labor market," he says, "and it's one of the few states that recognizes that it's jobs where the conditions are dangerous, they're precarious, there's no security, there's no benefits." Next on advocates' agendas is the issue of wage parity. 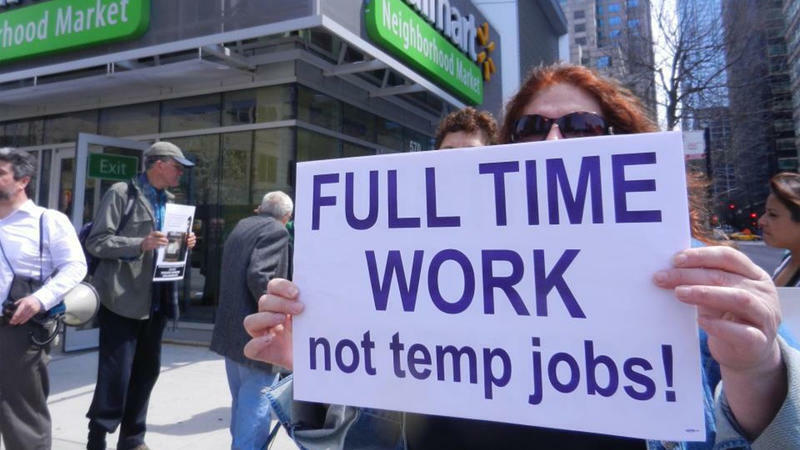 Bell says many temporary workers "end up working a job for 8 years, 10 years, 12 years--as a temp-- never getting vacation pay, never getting sick days, getting paid as little as half of what a direct worker makes." Agencies will also be required to make the effort to place workers into permanent jobs, and cover the expenses for background checks and drug tests. These changes go into effect June 2018.